HappyCleans ✨Stellar House Cleaning in OKC: What Exactly Does It Include? ✨Stellar House Cleaning in OKC: What Exactly Does It Include? Professional house cleaning in OKC is the fastest and easiest way to get a sparkling clean home. But what exactly do home cleaners clean? 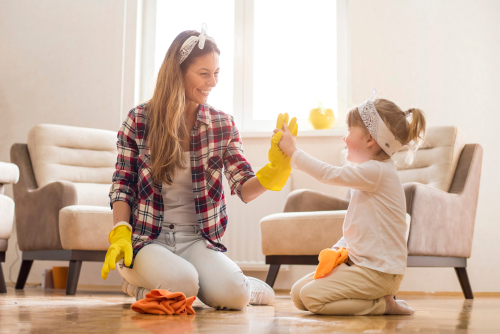 In general, what are the responsibilities of a house cleaner? 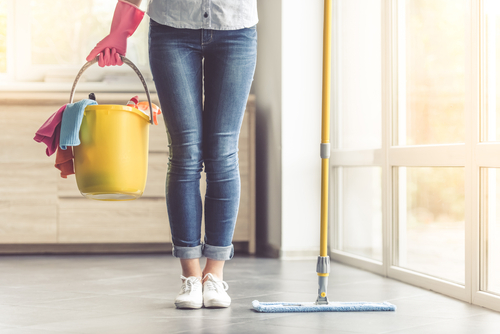 Read on to learn more about how cleaning ladies go about making a home shine, while also minimizing the time it takes to clean a house. The answers may surprise you. What to expect from a house cleaner? Your home cleaner absolutely must be polite, punctual, and trustworthy. Furthermore, reputable cleaning companies will only send you maids who follow optimized house cleaning checklists that speed up cleaning and also prevent them from missing important areas. Dusting decorations such as paintings, knickknacks, and wall clocks. Vacuuming, polishing, and dusting furniture. Mopping and vacuuming the floors. Cleaning the inside of the microwave. Dusting the top of appliances such as the fridge. Washing and disinfecting the sinks. Washing and disinfecting the stove-top. In addition to all that, quality cleaning companies will also offer an array of extra services that can be added onto your cleaning. These normally include cleaning inside the windows, and cleaning the interiors of the oven and the fridge. What rooms do house cleaners clean? 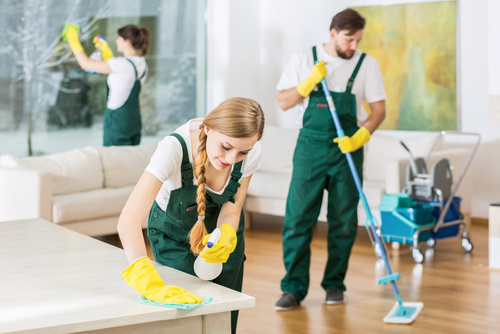 A reliable maid service automatically includes the kitchen and the living room in its cleaning, as these areas are assumed to exist in every home and therefore need cleaning. As for the bedrooms and the bathrooms, it depends on what you agreed on with your cleaning company. Luckily, you’ll be able to use an online booking form to specify the number of bedrooms and bathrooms you want cleaned. This is also an opportunity to schedule recurring cleanings (weekly, bi-weekly, monthly). 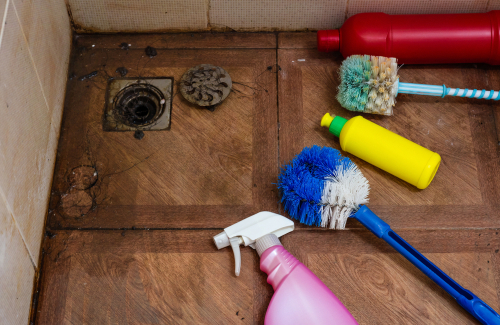 What to look for in house cleaners? First, make sure they’re trustworthy. Do they thoroughly screen, interview, and background and reference check the cleaners they work with to ensure maximum reliability, politeness, and professionalism? The last thing you want is to let some shady individual into your home. Do they have a 100% customer satisfaction guarantee? Ideally, if you’re unhappy with the cleaning you received, you should be able to give the cleaning service a call within 72 hours and report it, so they can come back and fix the problem free of charge. Do the maids bring their own equipment? Are they using safe, ISSA-approved cleaning products? Is their online payment system secure and hassle-free? Do they use flat hourly rates with no hidden fees? Located right next to Nichols Hills, HappyCleans is a first-rate Oklahoma City cleaning company that specializes in connecting you, our client, with top-notch career maids who can give you exactly the superb cleaning you desire. Our easy online booking form is designed to enable you to schedule the cleaning of your dreams in less than 60 seconds, using any device. Our total satisfaction guarantee and complex vetting process ensure that you will never receive a less-than-perfect service. Book a cleaning today, or reach out to us via phone or e-mail if you have any further questions. We are eager to become your go-to cleaning service in Oklahoma City.